That didn’t take long. We’ve just had another short-covering rip from the 1870 Bullard Bottom on the S&P 500 and it’s already petered out. Not even another one of the St. Louis Fed President’s bouncing billiard balls could keep the machines slamming the buy key. (n.) A person whose behavior resembles a rapid, spinning object. These actions are often spastic fidgeting and incessant babbling. The actions of the whirling dervish are irritating and annoying, often exhausting other people in the immediate vicinity. You can’t disagree with that, but the issue isn’t Bullard; its the entire central bank policy regime that is now racing towards a fiery dead-end. Bullard is just idiomatic—–the least reluctant of what will soon be a desperately flailing gaggle of Fed heads trying to explain that recession has returned, but that they are out of dry powder without a clue on what to do next. So it won’t be long before we get the big breakout to the downside. 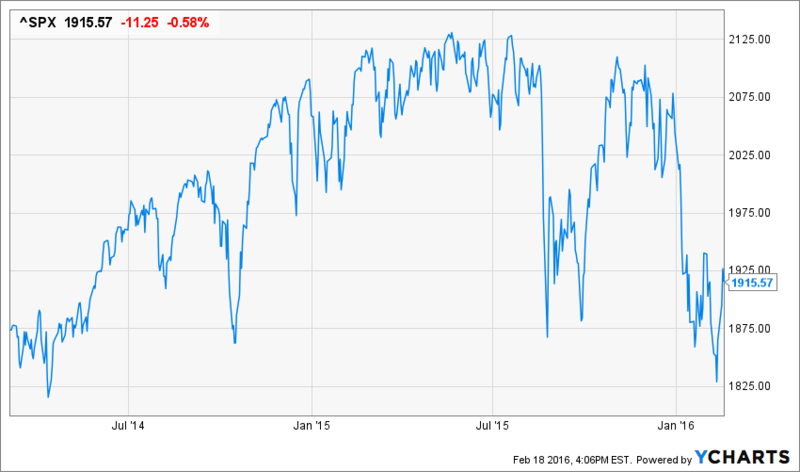 The stock market has been churning and cycling in no-man’s land between 1870 and 2130 on the S&P 500 for 700 days now. There have been upwards of 35 rally attempts and all of them have failed, including this most recent machine driven three-day spasm. It is a sheer understatement to say that the market’s generals are in full retreat and that the internals are looking ever more precarious. As to the latter, fully 60% of the S&P 500 members are down 20% or more and are thereby already wrestling hard with the bear. Likewise, the FANGs haven’t been able to keep it up, either. After last year’s classic market top—-during which they gained upwards of $500 billion of market cap versus an equal decline for the other 496 companies in the S&P index——they closed down today by $150 billion from year-end levels. Even the generals—-who shed $20 billion of market cap today alone—– are out of firepower. What is wanted now is the proverbial catalyst—–the take cover alarm that inevitably arouses Wall Street from its bullish slumber. Needless to say, it won’t be found in the technicals or even the earnings season results. After all, we have just had another down quarter, and based on honest GAAP earnings that you can’t go to jail for reporting to the SEC, the LTM net income per share for the S&P 500 appears to be coming in at about $90. That’s down 15% from the $106 per share cyclical peak posted for the LTM ended in September 2014. But technicals and earnings do not faze the casino because there is always another take on the stock charts; and reported earnings aren’t even noticed. It’s all about next year’s ex-items hockey stick, and that’s always 10-15% higher than the present. In fact, for the completed year of 2015 the street consensus for ex-items earnings started out at $137 per share back in March 2014 and appears to be coming in at just $106. But then, what’s a 23% slippage factor when investors have not yet demanded a recall of the sell side hockey sticks. In fact, the street 12-month consensus for 2016 now stands at $124/share (already down from $135 last spring); and $141 per share for 2017. Presumably, all of the economic headwinds and hiccups will have dissipated by then——-so what’s not to like about a two-year forward multiple of 13.6X? The water’s warm, jump right in! Then again, ponder this. The global economy is now visibly faltering under its incredible $225 trillion deposit of debt. The Red Ponzi has clearly entered the crack-up phase of its massive credit boom, and you don’t need Beijing’s medicated numbers to know the truth. Global trade has started out the year in a pure disaster mode, and one way or another it all links back to China’s collapsing construction site and vastly over-built export machine. Last night Japan reported that exports had plunged by a stunning 13% from last year—–notwithstanding the BOJ’s unstinting efforts to destroy the yen and goose the fading export machine of Japan Inc. But what is significant is that Japan’s exports to China were down 18%. At the same time, China’s own exports fell by nearly 11% from last January, while the export figure for India was down nearly 14%. Indeed, there is no better bellwether of the global economy than Korea Inc, yet it reported that sales to foreign customers had come in at negative 18.5%. Likewise, not only were export’s from Asia’s second most important trading hub, Singapore, down 10% from last January, but shipments to China were down by a staggering 25%. Let’s see. Which central bank is going to revive what is clearly a faltering EM world economy that is staggering under massive, unprecedented debts, and also an incredible surplus of everything? Not the Peoples Printing press of China, which is desperately trying to stem a tidal wave of fleeing capital. They can for a time pretend that they are supporting the Yuan’s external value while injecting massive gobs of overnight cash into the domestic banking system, but that’s a hard and fast monetary contradiction. Sooner or latter, and likely very soon, the red suzerains of Beijing will loose control of their exchange rate and face the mother of all capital outflows; or be forced into a domestic credit tightening that will bring down the entire $30 trillion mountain of debt. Either way, there is no avoiding a hard landing—–nay, a thundering crash—–in China, and with it a seismic shock to the phony global economy that has been erected on the back of the Red Ponzi over the last two decades. Needless to say, the NIRP twins are not remotely equipped to rollback the tide of global deflation and the resulting recession in trade and depression in CapEx investment. Draghi and Kuroda have succeeded only in generating a veritable catastrophe in their home banking systems—-a fact that even the casino punters have noticed by taking their bank shares down by 25% and 36%, respectively. Meanwhile, the fatuous notion that none of this disorderly global slump will lap upon these purportedly prosperous shores is living on fumes. It’s actually not even surprising that the Wall Street talking heads continue to appear on bubblevision peddling the “decoupling” myth. After all, they still have inventories of stock and other toxic risk assets to sell. But where the Bullard Whirling Dervish factor comes in is among the Fed heads themselves. These clueless Keynesian money pumpers are looking straight into the jaws of recession, yet are entirely oblivious. What is this man smoking? Certainly something a lot stronger than what I may legally procure at my current abode in Aspen Colorado! “When I look at my December forecast and compare it with my outlook forunemployment and core inflation today, there’s virtually no change,” Williams said. May the economic gods be with us. Those two variables are not the main street economy; they are the fetishistic preoccupation of the Fed’s posse of Keynesian ideologues. What does the arbitrary noise embedded in the swiggles of the BLS’ “core inflation” index have to do with anything? Here’s the CPI less food and energy. It was up exactly 2.08% during the year ending in December, and that’s roughly on trend with the 1.94% annual rate of change during this entire century. No one has survived without food and fuel that long, of course. But the point is that the Fed’s 2% inflation target is made from whole cloth, and is utterly irrelevant to the ingredients of true prosperity and wealth gains. Williams’ unemployment observation is even more ridiculous. Why would any one put stock in the U-3 measure of unemployment in light of the fact that 102 million adult Americans are not employed and the labor market participation rate has fallen out of bed? The chart below shows the radical break between the U-3 unemployment rate and the more comprehensive civilian employment/population ratio. Enough said. And that’s even before we get to the issue of job quality (bad) and the obsolete convention of basing the employment metric on head counts rather than the hours and gigs based reality of the real world. 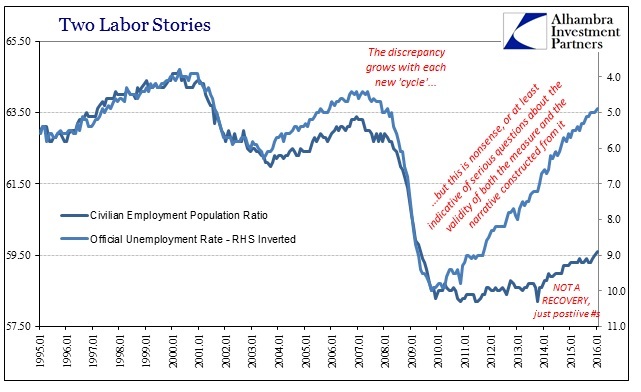 The fact is, there is a far more reliable indicator of the labor market than the trend-cycle projected/seasonally maladjusted/ five times revised junk data published by the BLS. Namely, the daily payroll tax collections of the IRS. It can be taken with a high level of confidence that employers do not send in a single dime in behalf of birth/death payrollers or seasonally adjusted workers who are on layoff. 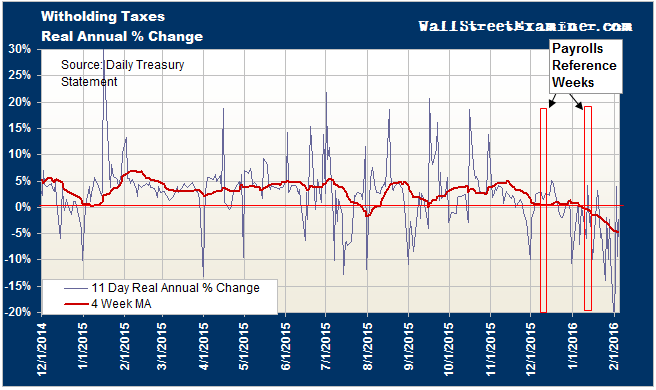 And recently the trend rate of tax collections has started falling sharply. According to my colleague, Lee Adler, the inflation adjusted collections rate has fallen to negative 4.5% on a year over year basis. In any event, payrolls are and always have been a lagging indicator. That is even more true after nearly two decades during which the C-suite has been turned into a stock trading room by the Bubble Finance regime of the Fed. Top corporate executives are so busy buying stock and doing massive, pointless, debt-financed M&A deals in order to goose their stock prices that they implicitly hoard labor until the stock market bubble collapses. Only then do they begin wholesale “restructuring” and job-slashing programs designed to rescue their battered stock options packages. Someone should send Williams the memo. Once upon a time, by contrast, practical men knew that when sales turn down and inventory ratios start rising sharply, there is trouble around the corner. After the recent release on December business sales and inventories, there can be little doubt that we are exactly there now. Total business sales including manufacturing, wholesale and retail were down 4.4% in December compared to the July 2014 peak, and the inventory/sales ratio has now climbed to 1.39X. That is well above where it stood last time the bottom dropped out in 2008. The list of similar recession indicators is long and getting longer. Corporate profits are falling; high yield credit is tanking; the freight index is down 7% over prior year; exports have plunged by 11% on an overall basis, and 20% for industrial materials and other front of the supply chain goods. Nor can any comfort be taken from the fact that auto sales have remained strong. As is made dramatically clear in the chart below, the boom in junk financed sub-prime auto lending has made it possible for any one who can fog a rearview mirror to buy a car. But when the junk market shuts down completely, they will be fogging far fewer mirrors. At the end of the day, however, there is no growth without strong capital investment, but that can’t happen in a world drowning in more excess capacity for everything than the world has ever previously known. It is not surprising, therefore, that new orders for nondefense CapEx less aircraft are now down 10.4% from their August 2014 peak; and, in fact, have dropped below the April 2007 level attained prior to the last economic plunge. Here’s the thing. The Fed doesn’t see it coming and would be petrified by the prospect of a Wall Street hissy fit were it actually to express doubts about the sustainability of this so-called recovery. At the same time, Wall Street fails to recognize the obvious truth that the Fed is out of dry powder. If it attempts QE4, it will be a confession of total failure and lack of efficacy. If it actually seeks to launch negative interest rates, it will ignite a political firestorm of untold intensity. So both parties are unprepared for what is coming down the pike, and that makes this time truly different. There will be no massive liquidity injection and quick reflation of risk assets because even the Fed can’t push on a string when it is out of dry powder. At length, the straggling remnants in the casino will look at 1870 and say, “support”, we hardly knew ya.